Imagine reciting a Shakespeare sonnet to a hip-hop beat, or Dr. Seuss with a country twang, Emily Dickinson as rhythm & blues. That’s what can happen when you sign up for our Open Mic Poetry Karaoke. We’ll supply the poems you choose from to read on-stage, you’ll spin our Big Wheel of Musical Genres and wherever the Big Wheel stops will tell you how you’ll read the poem. Billy Collins in a reggae rhythm? Keats in 80s pop? Sylvia Plath rockin’ Rock & Roll? Our live music and synthesized rhythm will supply the beats, you’ll give the poetry voice, the judges will give points and the audience will applaud. There’ll be prizes, too! 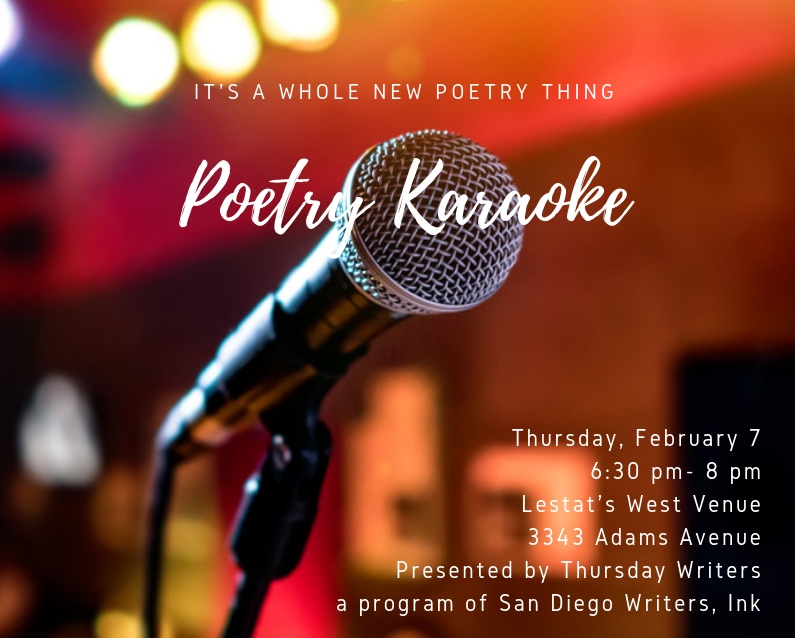 Join us for San Diego’s first-ever Open Mic Poetry Karaoke on stage at Lestat’s West Venue. Sign-ups start at 6:30 pm. Steve Montgomery and Judy Reeves are your hosts, with judges Michael Klam, Ying Wu and Chris Vannoy. The whole lively, extravagant event is brought to you by Thursday Writers, a program of San Diego Writers, Ink. Click on the flier for details. Here’s a poem from Karla Cordero, who features with Jeff Walt at the Feb. 22 Poetry & Art at SDAI. Poem previously published in Homestead Review. Here’s the flier for the upcoming Poetry & Art event on Feb. 22. Please share and spread the word! Art by Anya Klam.